Potash Corp. (TSX, NYSE:POT), Canada's largest fertilizer producer, said Wednesday it was revising its outlook because of delays in reaching contracts with commodity buyers in India and China. As a result, the company’s shares were down 29 cents, or 0.71%, at $40.81 at mid-morning Wednesday (ET). Earnings for the full 2012 financial year will fall below even the lowest previous estimate of $2.80 to $3.20 per share, the company warned. The Saskatchewan-based company also said earnings for the third quarter will be at the lower end of its estimate of between 70 and 90 cents per share. The company said it would provide further details when its third-quarter financial results are released next week, on Oct. 25. Only last month, the firm raised its quarterly dividend payment by 50%, signalling confidence in the demand outlook. PotashCorp is the world's largest crop-nutrient producer by capacity and the Canadian province of Saskatchewan holds the largest deposits of potash, a valuable mineral mainly used in fertilizer. 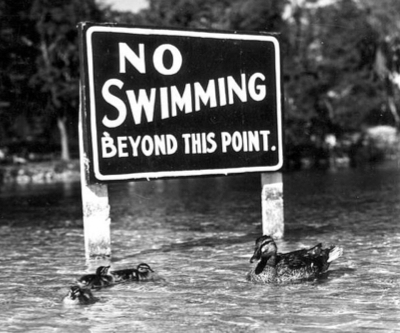 Image: Ducks swimming in front of warning sign, State Library and Archives of Florida.